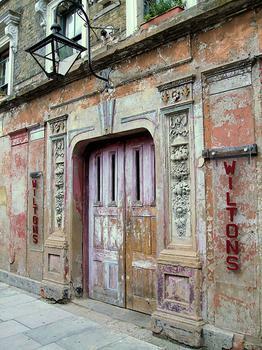 Wilton's Music Hall, built in 1858, is the oldest Grand Music Hall in the world that is used nowadays as a performance hall for theatre, comedy, opera, puppetry, cinema and cabaret. Wilton's Music Hall, built in 1858, is the oldest Grand Music Hall in the world that is used nowadays as a performance hall for theatre, comedy, opera, puppetry, cinema and cabaret. It is a 19th century music hall attached to an 18th century alehouse known at the time as The Mahogany Bar. With a history as colorful as London itself, it was once the haunt of Victorian sailors, then become an East London Methodist Mission, survived two world wars, became a rag storage warehouse and finally ended up as a theatre again.